The properties are situated within their own courtyard reached by a sweeping brick driveway with a private entrance. Each has its own carport and good-sized rear gardens enjoying the sun from the south, currently turfed with patio areas leading from the living space. A wonderful blank canvas for any keen gardener, for fulfilling home grown veg dreams or finding space to entertain. Whilst the outside of the properties are nostalgically reminiscent of centuries past, the interiors are beautifully modern and on-trend with soft-grey thick pile carpets, and tiled oak effect floors. The en-suites feature walk-in showers with rainwater showerheads for a relaxing morning routine, whereas for long evenings, some of the bathrooms house freestanding baths, the perfect accompaniment for bubbles and champagne. The kitchens are very well equipped for entertaining and for an easy to manage modern family lifestyle. Blomberg washing machines and dryers are included in separate utility rooms ideal for keeping laundry out of sight, and the integrated oven, fridge freezer, and dishwasher create a streamlined kitchen environment. Stylish quartz worktops are included, along with a breakfast bar for a sociable chat during cooking, and a more formal dining area for family meals. 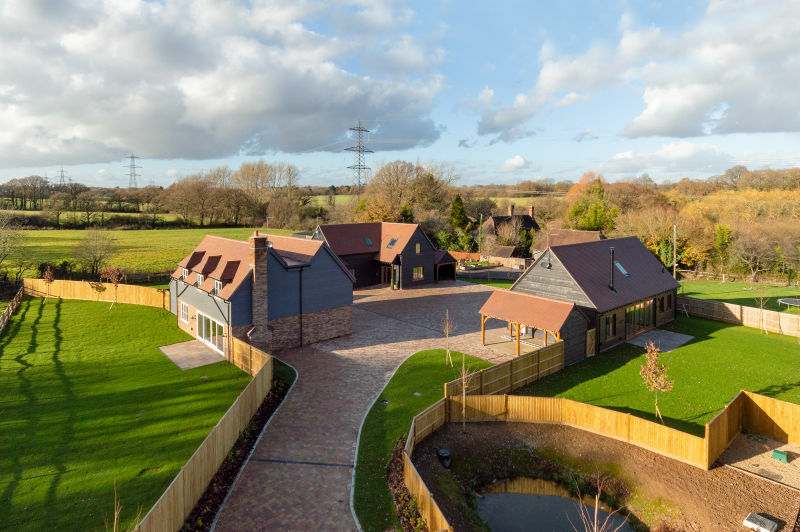 Gather round the modern wood burner for a cosy night in or keep warm throughout the day with the individually zoned underfloor heating, letting the inhabitant of each bedroom control their own climate. Twineham is situated close to the village of Hurstpierpoint, and the major Mid Sussex towns of Haywards Heath and Burgess Hill, both of which have train stations on the London mainline. It is just a short drive to the fun-filled city of Brighton and Hove and the historical town of Lewes. There is a wide choice of small and large golf courses to play in the surrounding areas including Singing Hills, Mid Sussex, Hassocks and Pyecombe. The Hickstead showground is a few minutes drive, along with several private schools including the prestigious Hurst (Hurstpierpoint College). For a brochure and to book a viewing of the properties please contact our Residential Sales office on 01273 688881, email brighton@oakleyproperty.com or pop into our inviting New Homes lounge in North Road, Brighton.